Even though OwnerRez has a wide array of financial features - from invoicing and payment collection to expense tracking - OwnerRez is not an accounting product. There are many standard accounting features that OwnerRez does not (and probably will never) offer like double-entry bookkeeping, registers, bank reconciliation, liability tracking, P&L statements, depreciation, balance sheets and so on. For those things, you should use a traditional accounting product like QuickBooks, Xero or Wave to make sure your finances are correct. Please note that we do have a full-featured property management feature that follows a trust/escrow accounting model where it is assumed that you are collecting payments from guests as "rents in trust" in a separate escrow bank account. We then provide "payouts" statements, for both the owner and the PM (you! ), so that money is moved from escrow to the rightful party at periodic times. But in terms of pure accounting and financial reconciliation, we understand that working in multiple software products on a regular basis can be time-consuming, particularly if you have to copy/paste information from OwnerRez into an accounting product on a regular basis. To that end, we have developed a premium feature called "QuickBooks Integration" so that our system can automatically push financial data from OwnerRez directly into QuickBooks without you lifting a finger. What Exactly Is Transferred to QuickBooks? Because QuickBooks and OwnerRez are both online products, accessible from the internet, they are able to talk to each other via code that Intuit and OwnerRez have built under the covers. This code is developed according to published specifications so that each team can make their products share information in a clean and secure way. The first step is for you to follow our support article on Connecting and Setting Up QuickBooks Integration which will establish a secure connection between OwnerRez and QuickBooks. Notice that you must use QuickBooks Online; we do not support or integrate with QuickBooks Desktop. Once QuickBooks is connected and configured for a property, all bookings that are changed thereafter will start syncing with QuickBooks. OwnerRez will silently send data to your QuickBooks account, under the covers, without you doing anything or pressing any buttons. Even changing the name or guest count on the booking will trigger a sync. The keyword there is "thereafter". Booking changes (whether created, updated or canceled) that occurred before QuickBooks was configured will not automatically be sent to QuickBooks unless you go to each of them and trigger a manual sync. When bookings are created, updated or canceled in your OwnerRez account, our system will create corresponding updates in your QuickBooks account. Each OwnerRez booking is mapped to a single "invoice" in QuickBooks and payments are synced as well. Keep those terms in mind - bookings and invoices. An OwnerRez "booking" is the same as a QuickBooks "invoice". Once you understand that concept, the relationship between the two systems will become more obvious. OwnerRez determines if an invoice exists in QuickBooks for the booking in question. If not, it creates a new invoice in QuickBooks. 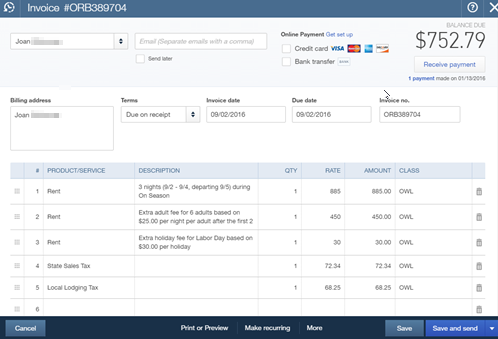 If it exists, it updates the current invoice to match the OwnerRez booking data (guest name, line item charges, etc). If you search QuickBooks with your OwnerRez booking number, you should find a corresponding invoice with the same number. The OwnerRez booking number is the one that begins with "ORB" and is visible at the top of every booking in OwnerRez. You can also find invoices in QuickBooks by looking at your QuickBooks "customers" and finding one with the same name as the booking guest. After the booking is created or updated, OwnerRez then makes sure that OwnerRez payments are synced to QuickBooks so that the invoice also shows the same payments. 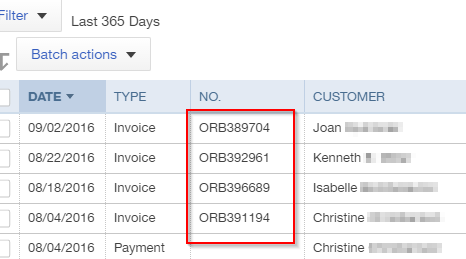 There should always be the exact same payments in QuickBooks as there is in OwnerRez - both in number, date and amount. For the moment, refunds and security deposit are not synced with QuickBooks. This is because there are several ways "credits" can be recorded in QuickBooks and the way you do your accounting makes a difference. Security deposits, likewise, would create complications, so we've left them out too. We do not create "deposit" records in QuickBooks because there is no way for OwnerRez to know which payments settled together or if you deposited them at different times. You will need to manually record deposits on your own, though having OwnerRez payments automatically entered should make that process significantly easier. The QuickBooks "create deposit" screen will show all the open or "undeposited" payments that are in your account including any that OwnerRez created. QuickBooks Online has customers all over the world, and so they've has built a lot of different settings for the different financial paradigms in which those customer operate. Because of this, we have had to customize our integration for changes that we've found in different customer's accounts. We have successfully tested the USA and Canadian versions of QuickBooks and know that both work well. If you have a different version of QuickBooks Online and the sync doesn't seem to be working correctly, please let us know. We'd be happy to figure out what's different about your country or version and work with you to support it. Our QuickBooks Integration is one of the few "premium features" in OwnerRez that costs an extra amount over and above the normal monthly pricing. Our Costs & Fees article lays out exactly what that is based on the number of properties you manage. Get started today by connecting and configuring your QuickBooks account.